A trench at the Battle of the Somme. This is the second part of a feature, the first in a three-part series spread over coming months, which aims to mark the centenary of the Somme campaign, which lasted from June 24 to November 18, 1916, by reflecting on its impact on the wider Alnwick district. The entry in the Alnwick and County Gazette announcing the death of Captain Arthur Cecil Young. Another man to die on the first day of the battle – July 1, 1916 – was Lieutenant Geoffrey Euan Sanderson who served with the Royal Fusiliers (City of London Regiment), Public Schools Battalion, attached to Machine Gun Corps. He had earlier served as a Lieutenant in the Royal Irish Rifles, 9th (Service) Battalion (West Belfast). Geoffrey’s parents, William John and Amy Sanderson of Eastfield Hall, Warkworth, lost two sons during the war. His elder brother, Philip Noel Sanderson, died in the 1915 Dardanelles campaign. Geoffrey, too, is commemorated on the Thiepval Memorial, as well as on the Warkworth War Memorial by St Lawrence’s Church in which there’s an individual plaque dedicated to him. The Sandersons were by no means the only local family to lose two or more sons during the war. More than 20 did so, including William and Selina Young, of Aldersyde, Alnwick. Their younger son, Captain Arthur Cecil Young commanded ‘A’ Company of the Northumberland Fusiliers’ 16th (Service) Battalion (Newcastle) – frequently referred to as the ‘Newcastle Commercials’ – for the assault on July 1. His elder brother, Lieutenant Charles Edward Young joined the East African Mounted Rifles in August 1914 and was serving with the Military Labour Corps when he died at Dar Es Salaam on 17 December 1918. Arthur is commemorated on the Thiepval Memorial and Alnwick War Memorial. Private William Storey enlisted at Alnwick and served with the Alexandra, Princess of Wales’s Own (Yorkshire Regiment), 10th (Service) Battalion. Born in 1881 at Whittingham, William was the son of John and Annabella (née Slassor) Storey. His father was then employed as a general labourer but he had died by the time of the 1891 Census when William was living at Eslington Cottages with his widowed mother and four siblings. The 1901 Census show William as single, living and working as a shepherd for George and Elizabeth Weatherall, farmers at Whittingham. William’s younger brother, John Storey, was killed in action, on October 4, 1917, while serving with the same regiment. William is another commemorated on the Thiepval Memorial while John is buried at Tyne Cot Cemetery, and both are commemorated on the Roll of Honour at St Bartholomew’s Church, Whittingham. Another to have served with the Alexandra, Princess of Wales’s Own (Yorkshire Regiment), 10th (Service) Battalion was Private David Archibald Proudlock who was killed in action on July 12, 1916. He, too, is commemorated on the Thiepval Memorial and the Roll of Honour at St Bartholomew’s Church, Whittingham, as well as on a plaque at Whittingham Memorial Hall. His name is misspelt as ‘Proudlack’ on the Commonwealth War Graves Commission database. Born in 1893 at Whittingham, David was the youngest of six children of Thomas and Margaret Ann (née Makepeace) Proudlock. His parents were then living at Raynards Lodge, Whittingham, where Thomas farmed 38 acres of land. By 1891, Thomas was additionally described as a road contractor. In 1911, David, then aged 17, was lodging at the Old Kennels, Blagdon, and employed as a domestic gardener. Private Michael Timlin served in ‘A’ Company of the Northumberland Fusiliers’ 12th (Service) Battalion. Another commemorated on the Thiepval Memorial, his presumed death is recorded as having been on July 3, 1916. The source of the presumption of death is the UK, Army Registers of Soldiers’ Effects, 1901-1929 (available via Ancestry.co.uk), which records Michael’s sole executor as Grace Barron. Michael was 25 at the time of his death. He was born at Amble and enlisted at Ashington. The WW1 Service Medals and Award Rolls 1914-1920 (also via Ancestry.co.uk) show him as having disembarked in France on September 9, 1915, so he was entitled to the 1914-15 Star in addition to the British War and Victory Medals. To understand why the roll of honour is so lengthy it is necessary to reflect on what really went wrong during those fateful days at the beginning of July 1916. British military and industrial resources were still gearing up to support for the first time an army engaged in continental-scale fighting. While the unprecedented number of artillery pieces available for the campaign – 400 heavy guns and 1,000 field guns – may have appeared impressive, in truth the number was totally inadequate to crush complex defensive systems over a front 20 miles wide and 4,500 yards deep. There were simply too many targets and key elements of the German’s defensive systems to be knocked out, especially machine gun positions in close proximity to the front-line and the mass of heavy guns well behind it. On the British front, there was one heavy gun for every 57 yards of front attacked, on the French front there was one for every 20 yards. There were serious inadequacies in the quality and type of munitions amassed – for example, the Ministry of Munitions had abandoned all forms of quality control in an attempt to increase output of artillery shells, consequently many of the 1.7million fired during the initial bombardment failed to explode. Perhaps more significant was the inappropriate proportion of shrapnel shells fired, which may have cut some of the wire but were ineffective against troops in well-constructed dugouts. Defective intelligence on the strength of German defences and, especially, on the effectiveness of the preparatory bombardment led to tactical decisions which were flawed and contributed to the enormous loss of life, notably on July 1, 1916. Poor infantry-artillery co-ordination prevented the pre-attack bombardment from returning to German front-line positions as their men emerged from artillery-proof dugouts to man machine gun positions and trench firing steps to meet the coming assault. Only five of 17 attacking Divisions entered German positions. Uncut wire and murderous fire from front-line German positions and massed supporting artillery behind stopped the remainder in ‘no-man’s land’. Lines of attacking troops were simply mown down. Many mistakes were made but hard lessons were learnt and applied quickly. Heavy manpower losses were sustained for few tangible rewards but by the end of July, the Germans were forced to go onto the defensive around Verdun, partly because of the pressure of having to cope also with the assault on the Somme. 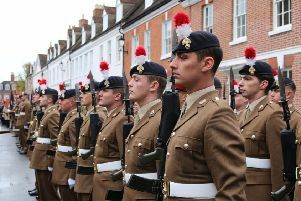 Evolution of the British Army’s organisation, tactics and weaponry began on those fields which eventually led, in 1918, to it being the most powerful and effective of all belligerents’ armies, and to eventual victory.